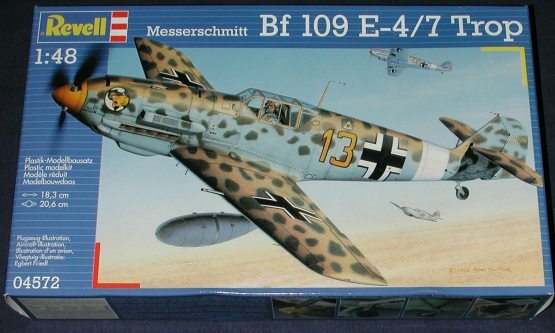 The first war-time Bf-109 was the E version. It was in several ways superior to the aircraft it fought early in the war, but by the time of the Battle of Britain, it was up against planes of the RAF (the Spitfire) that were in many ways its equal. The Luftwaffe started out against the RAF with the E-1 and E-3 variants. The E-1 was all machine gun armed while the E-3 replaced the wing machine guns with 20mm cannon. These two variants were produced simultaneously. The E-4 had a small engine horsepower improvement and introduced a stronger canopy/windscreen and head armor. The E-7 was the last of the Emils and introduced the ability to carry a drop tank. Bomb racks were retrofitted on all Emils about half-way through the Battle of Britain and those types were suffixed with a B. So bomb capable E-1s were 'Bf-109E-1/B' and so on. Unusually, no drop tank capable 109s were used during the Battle of Britain. This severely hampered the range and loiter time of escorting fighters. Often they had to leave the bombers due to lack of fuel. One of the many unknown gaffes of the Germans during the war. Eventually, drop tanks were retrofitted on to E-4 and some earlier versions, but this wasn't until after the Battle. Toward the end of 1940 the Bf-109F started to appear which eclipsed the E model in total by the middle of 1942 in front line Luftwaffe units. What you have here is yet another collaboration between Revell and Hasegawa. I guess it is easier to come up with 'new' kits by doing this. In Europe the savings between Hasegawa and Revell kits is pretty great by using this method. Here in the US it is only the matter of a dollar or two, so not really that much of a savings. However, it also allows for 'new' ProModeler kits to be marketed here. 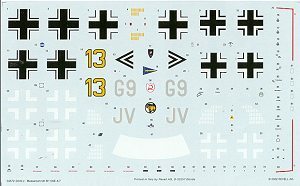 If you want to know about the kit itself, I'll weasel out of things and relate you to the Hasegawa 1/48 Bf-109E preview from which I pinched the shot of the sprues. There are, however, some differences between this and the Hasegawa boxing. One is that you only get the canopy bits for the E-4/7 and not the earlier E-3. The other is that you do not get the etched metal fret. That means no radiator screens and no head armor. The instructions tell you to cut this last part from a clear bit labeled D-5 and trim to fit. Not exactly the most elegant solution and not really the correct shape, but better than nothing. Though the kit would have you not use them, you can make a jabo from this kit by installing the bomb rack and bomb. You also get the optional pointed spinner to use and a tropical filter for the supercharger intake. Instructions are the usual newsprint versions typical of RoG. They provide color information using what appears to be Humbrol paint numbers. 'RIM' numbers (I think they mean RLM) are provided on the decal and overall camo page. Markings (without swastikas) are provided for three aircraft. One is the box art E-7/tropaircraft from 3./JG 27 as allegedly flown by Hans-Joachim Marseille in early 1941. It is sand with dark splotches over RLM 65. Since the underside is RLM 65, the sand is probably one of the various Italian colors. The green splotches are stated as RLM 71, but again, I think it most probable to be an Italian color. A true factory painted desert scheme would have had an RLM 78 underside. Next is another popular aircraft, that of Helmut Wick of I./JG 2 in 1940. His E-4 is in RLM 71/02 over 65 with the fuselage stippled in RLM 71. It has yellow on the cowling, wing tips and rudder. Finally the one interesting scheme on the sheet. This is an E-4 from III./NJG 1 in 1941. This aircraft is painted overall black with light grey markings. It was normal for 'older' fighters to be used as night fighters early in the Luftwaffe's night fighting program. The decals themselves are rather matte and printed in Italy (perhaps by Cartograf, but it doesn't seem like it). They have quite a bit of carrier film around them that will need trimmed, and, of course, you'll have to get your swastikas from another source. 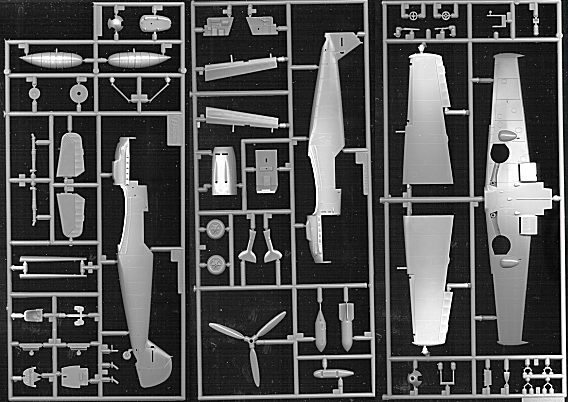 It is a Hasegawa kit, though not a complete Hasegawa kit (etched bits). Frankly, unless you can get this kit at a substantial savings over the Hasegawa kit (as I did) , I'd pass on it and go for the real McCoy. It will build into a very nice model and I'm sure that there will be no surprises, but I want my etched bits! !